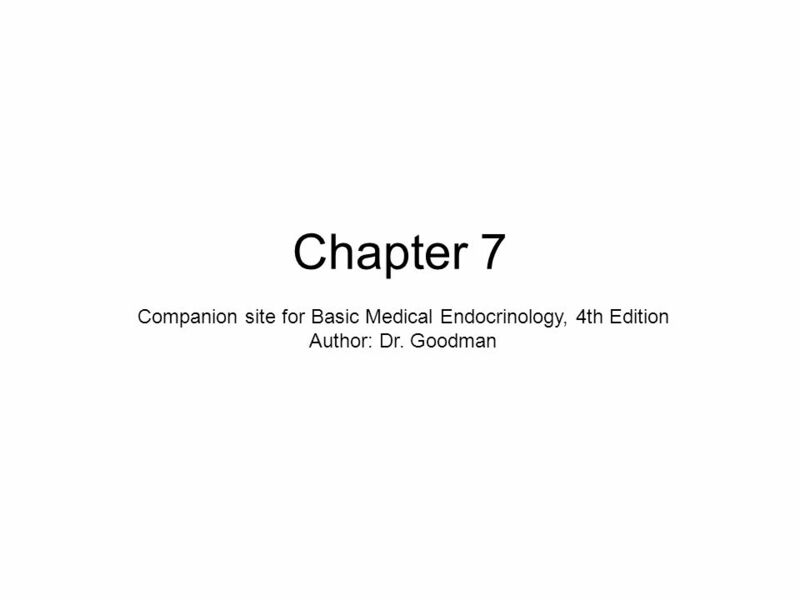 Chapter 7 Companion site for Basic Medical Endocrinology, 4th Edition Author: Dr. Goodman. 2 Copyright © 2009 by Academic Press. All rights reserved. FIGURE 7.1 Cytoarchitecture of a typical human pancreatic islet as revealed in immunostained confocal scanning microscopic images. Endocrine cells are closely but randomly associated with vascular cells. 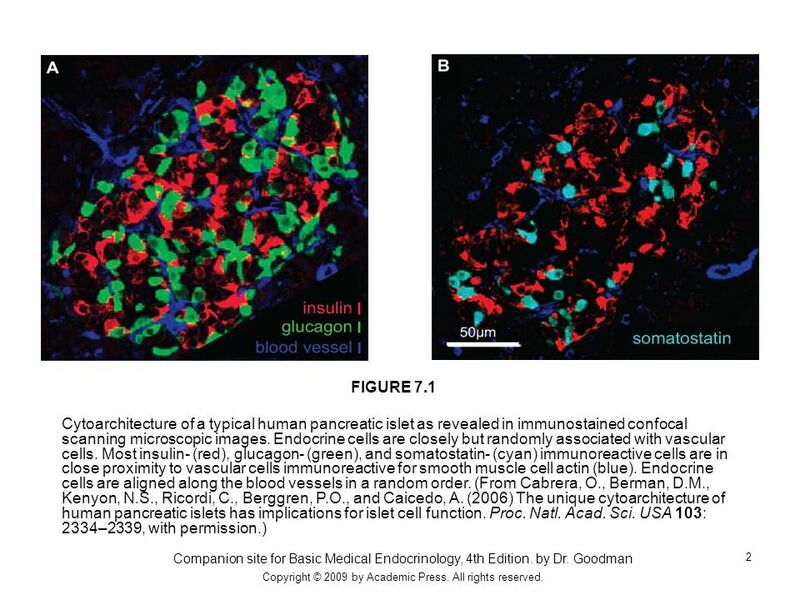 Most insulin- (red), glucagon- (green), and somatostatin- (cyan) immunoreactive cells are in close proximity to vascular cells immunoreactive for smooth muscle cell actin (blue). Endocrine cells are aligned along the blood vessels in a random order. (From Cabrera, O., Berman, D.M., Kenyon, N.S., Ricordi, C., Berggren, P.O., and Caicedo, A. (2006) The unique cytoarchitecture of human pancreatic islets has implications for islet cell function. Proc. Natl. Acad. Sci. USA 103: 2334–2339, with permission.) Companion site for Basic Medical Endocrinology, 4th Edition. by Dr. Goodman Copyright © 2009 by Academic Press. All rights reserved. 3 Copyright © 2009 by Academic Press. All rights reserved. 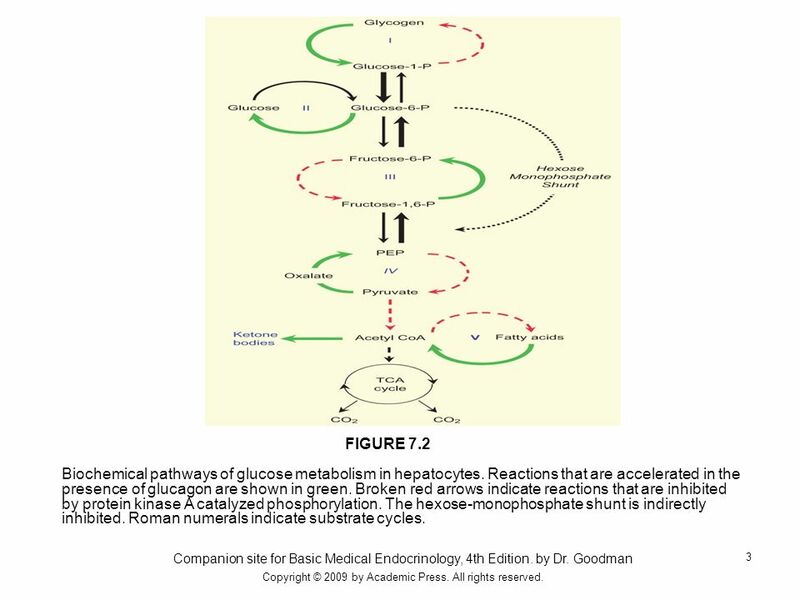 FIGURE 7.2 Biochemical pathways of glucose metabolism in hepatocytes. Reactions that are accelerated in the presence of glucagon are shown in green. Broken red arrows indicate reactions that are inhibited by protein kinase A catalyzed phosphorylation. The hexose-monophosphate shunt is indirectly inhibited. Roman numerals indicate substrate cycles. Companion site for Basic Medical Endocrinology, 4th Edition. by Dr. Goodman Copyright © 2009 by Academic Press. All rights reserved. 4 Copyright © 2009 by Academic Press. All rights reserved. 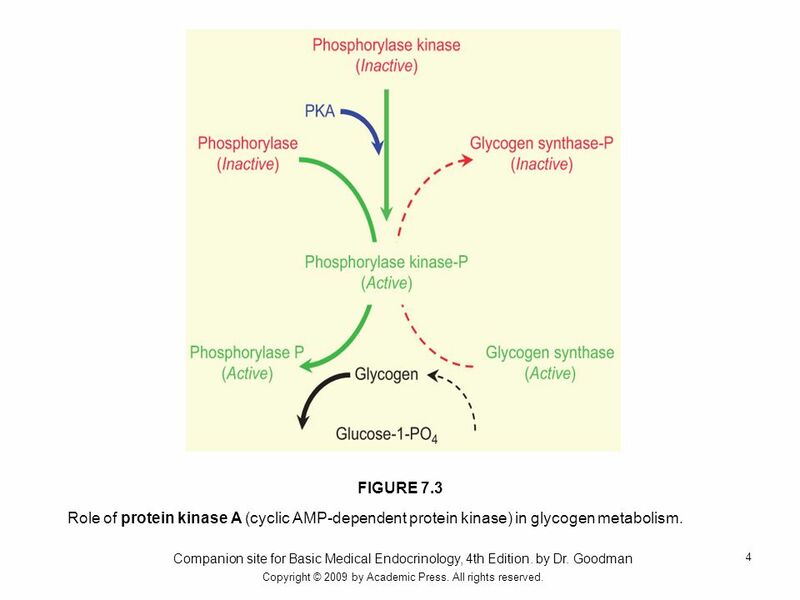 FIGURE 7.3 Role of protein kinase A (cyclic AMP-dependent protein kinase) in glycogen metabolism. Companion site for Basic Medical Endocrinology, 4th Edition. by Dr. Goodman Copyright © 2009 by Academic Press. All rights reserved. 5 Copyright © 2009 by Academic Press. All rights reserved. FIGURE 7.4 Regulation of fructose-1,6-bisphosphate metabolism by protein kinase A (cyclic AMP-dependent protein kinase). Formation of fructose-1,6-bis phosphate is accelerated by the metabolite fructose-2,6-bisphosphate, which stimulates phosphofructokinase and inhibits fructose-1,6-phosphatase. Protein kinase A lowers the concentration of fructose-2,6-bisphosphate by catalyzing phosphorylation of the bifunctional enzyme 6 phosphofructose-2 kinase/fructose-2,6-bisphosphatase, which promotes its phosphatase activity. 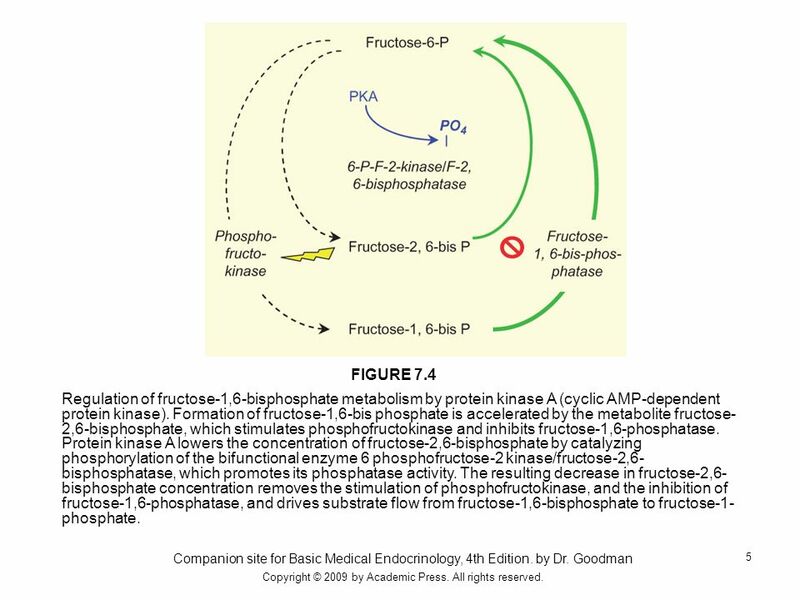 The resulting decrease in fructose-2,6-bisphosphate concentration removes the stimulation of phosphofructokinase, and the inhibition of fructose-1,6-phosphatase, and drives substrate flow from fructose-1,6-bisphosphate to fructose-1-phosphate. Companion site for Basic Medical Endocrinology, 4th Edition. by Dr. Goodman Copyright © 2009 by Academic Press. All rights reserved. 6 Copyright © 2009 by Academic Press. All rights reserved. FIGURE 7.5 Regulation of phosphoenol pyruvate (PEP) formation by protein kinase A (PKA, cyclic AMP-dependent protein kinase). 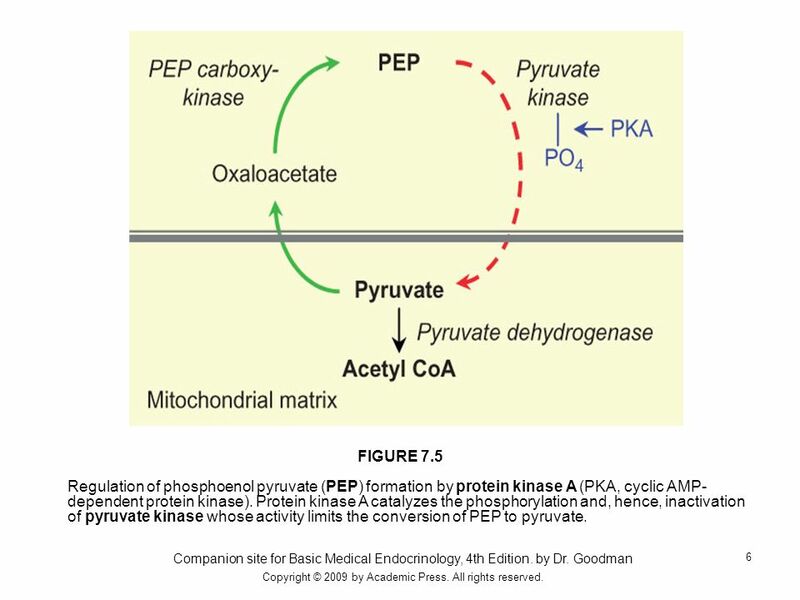 Protein kinase A catalyzes the phosphorylation and, hence, inactivation of pyruvate kinase whose activity limits the conversion of PEP to pyruvate. Companion site for Basic Medical Endocrinology, 4th Edition. by Dr. Goodman Copyright © 2009 by Academic Press. All rights reserved. 7 Copyright © 2009 by Academic Press. All rights reserved. 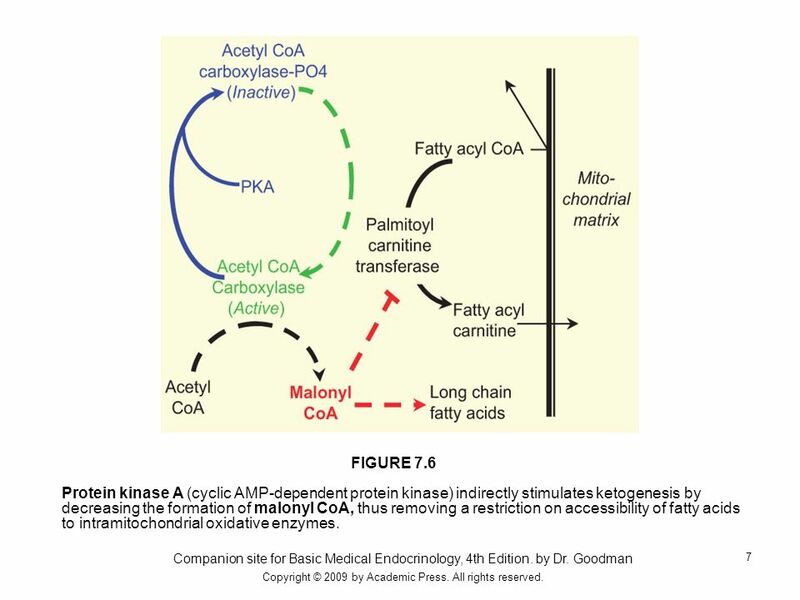 FIGURE 7.6 Protein kinase A (cyclic AMP-dependent protein kinase) indirectly stimulates ketogenesis by decreasing the formation of malonyl CoA, thus removing a restriction on accessibility of fatty acids to intramitochondrial oxidative enzymes. Companion site for Basic Medical Endocrinology, 4th Edition. by Dr. Goodman Copyright © 2009 by Academic Press. All rights reserved. 8 Stimulatory and inhibitory signals for glucagon secretion. 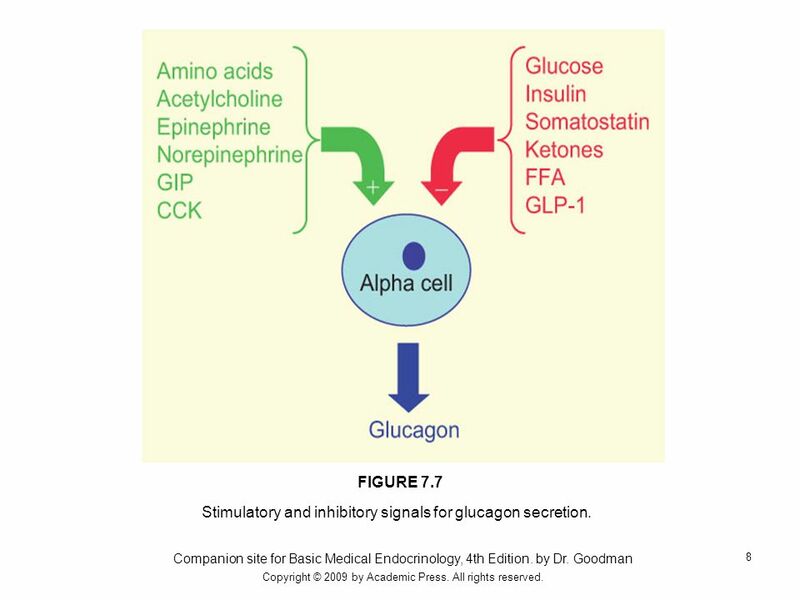 FIGURE 7.7 Stimulatory and inhibitory signals for glucagon secretion. Companion site for Basic Medical Endocrinology, 4th Edition. by Dr. Goodman Copyright © 2009 by Academic Press. All rights reserved. 9 Copyright © 2009 by Academic Press. All rights reserved. FIGURE 7.8 Post-translational processing of preproinsulin. The leader sequence is removed and the molecule folds in a way that lines up cyteines so that disulfide bonds can form. After packaging into secretory granules prohormone convertases excise the connecting peptide. Companion site for Basic Medical Endocrinology, 4th Edition. by Dr. Goodman Copyright © 2009 by Academic Press. All rights reserved. 10 Copyright © 2009 by Academic Press. All rights reserved. 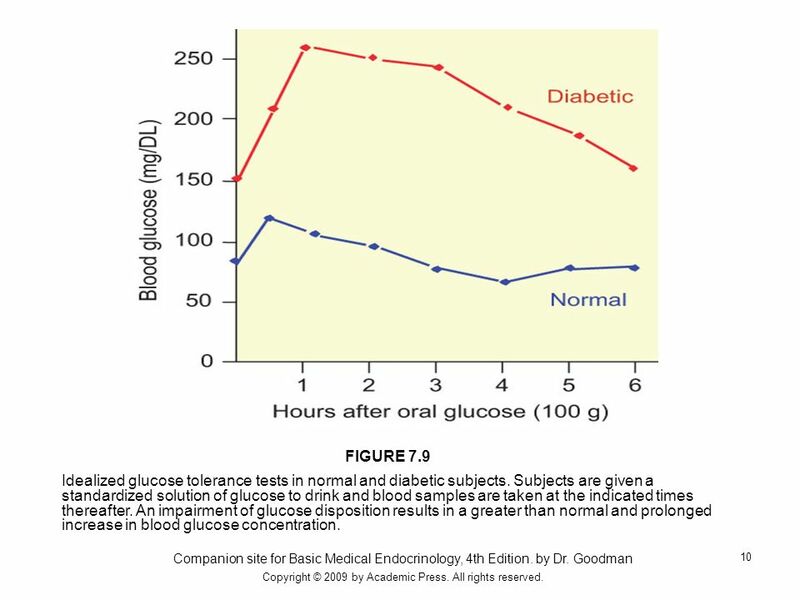 FIGURE 7.9 Idealized glucose tolerance tests in normal and diabetic subjects. Subjects are given a standardized solution of glucose to drink and blood samples are taken at the indicated times thereafter. An impairment of glucose disposition results in a greater than normal and prolonged increase in blood glucose concentration. Companion site for Basic Medical Endocrinology, 4th Edition. by Dr. Goodman Copyright © 2009 by Academic Press. All rights reserved. 11 Copyright © 2009 by Academic Press. All rights reserved. FIGURE 7.10 Carbohydrate and lipid metabolism in adipose tissue. 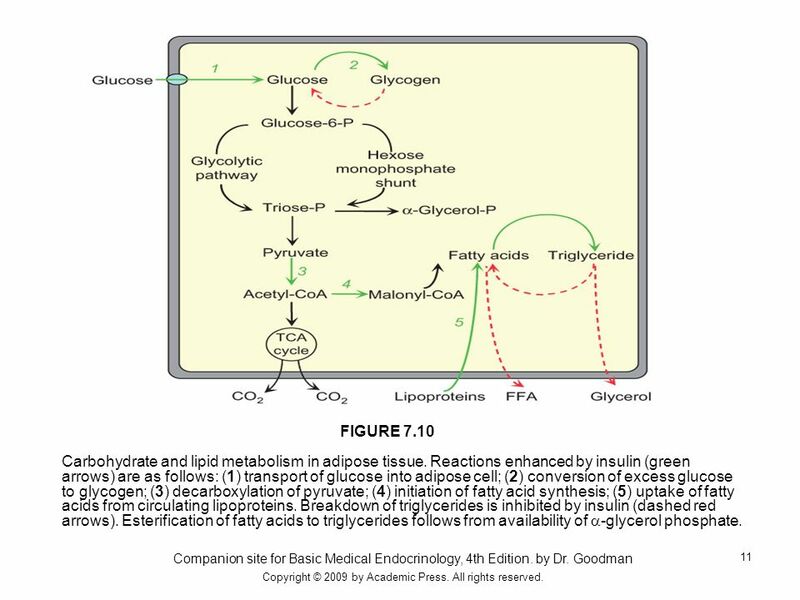 Reactions enhanced by insulin (green arrows) are as follows: (1) transport of glucose into adipose cell; (2) conversion of excess glucose to glycogen; (3) decarboxylation of pyruvate; (4) initiation of fatty acid synthesis; (5) uptake of fatty acids from circulating lipoproteins. Breakdown of triglycerides is inhibited by insulin (dashed red arrows). Esterification of fatty acids to triglycerides follows from availability of -glycerol phosphate. Companion site for Basic Medical Endocrinology, 4th Edition. by Dr. Goodman Copyright © 2009 by Academic Press. All rights reserved. 12 Copyright © 2009 by Academic Press. All rights reserved. 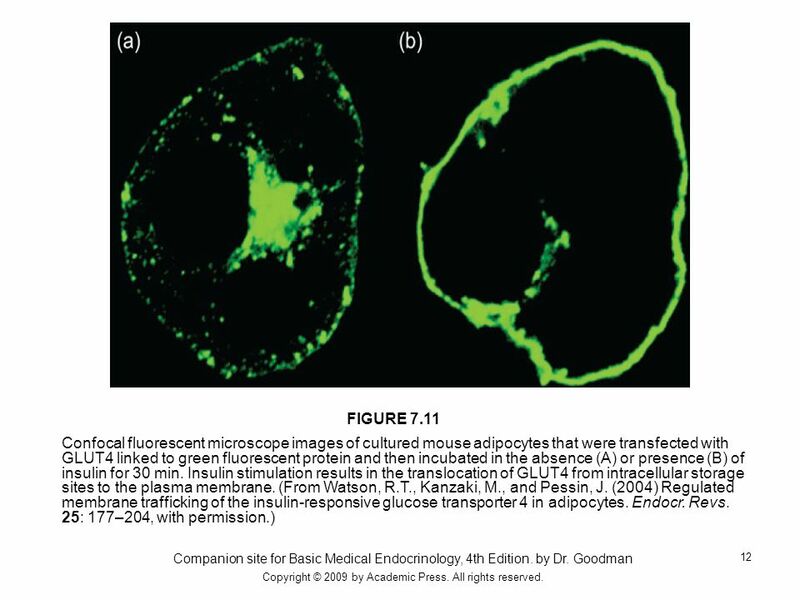 FIGURE 7.11 Confocal fluorescent microscope images of cultured mouse adipocytes that were transfected with GLUT4 linked to green fluorescent protein and then incubated in the absence (A) or presence (B) of insulin for 30 min. Insulin stimulation results in the translocation of GLUT4 from intracellular storage sites to the plasma membrane. (From Watson, R.T., Kanzaki, M., and Pessin, J. (2004) Regulated membrane trafficking of the insulin-responsive glucose transporter 4 in adipocytes. Endocr. Revs. 25: 177–204, with permission.) Companion site for Basic Medical Endocrinology, 4th Edition. by Dr. Goodman Copyright © 2009 by Academic Press. All rights reserved. 13 Copyright © 2009 by Academic Press. All rights reserved. FIGURE 7.12 Metabolism of carbohydrate and lipid in muscle. Rate-limiting reactions accelerated by insulin (green arrows) are: (1) transport of glucose into muscle cells; (2) phosphorylation of glucose by hexokinase; (3) storage of glucose as glycogen; (4) addition of the second phosphate by phosphofructokinase; (5) inhibition of fatty acid entry into mitochondria by malonyl CoA. Red arrows indicate reactions that are inhibited. Companion site for Basic Medical Endocrinology, 4th Edition. by Dr. Goodman Copyright © 2009 by Academic Press. All rights reserved. 14 Copyright © 2009 by Academic Press. All rights reserved. 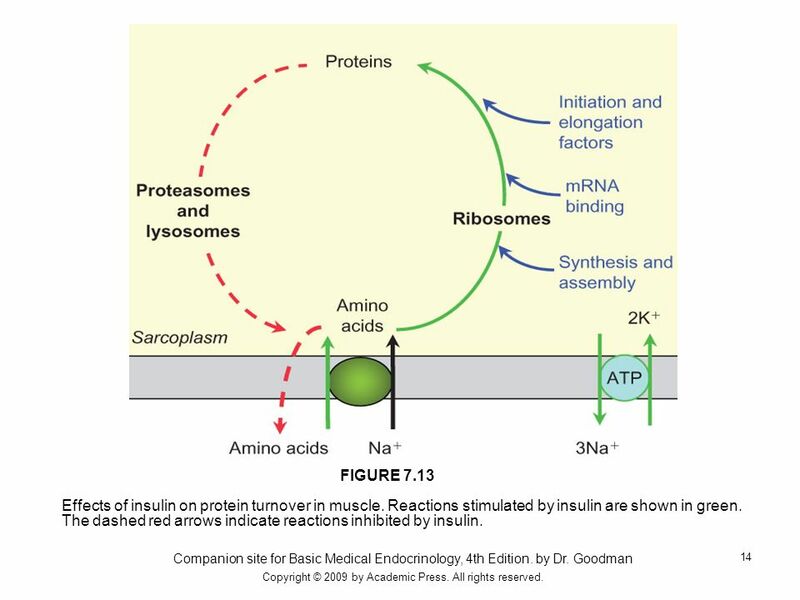 FIGURE 7.13 Effects of insulin on protein turnover in muscle. 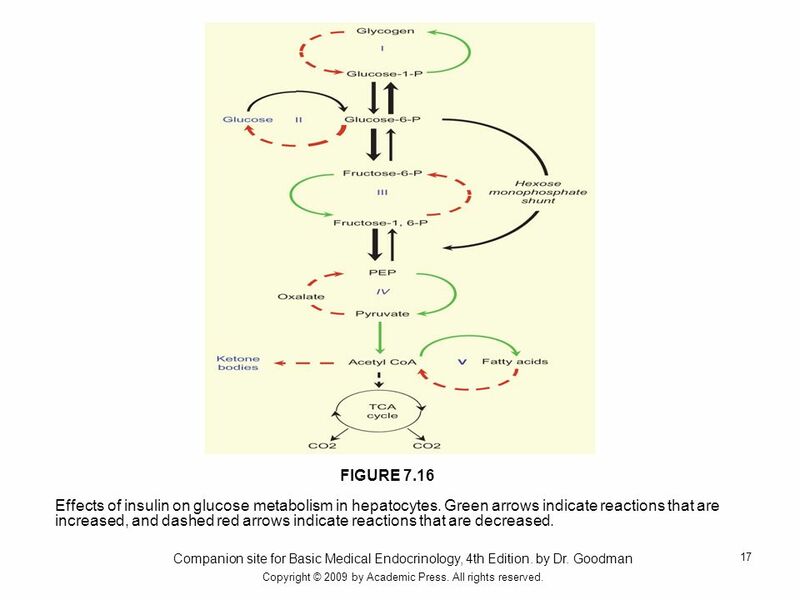 Reactions stimulated by insulin are shown in green. The dashed red arrows indicate reactions inhibited by insulin. Companion site for Basic Medical Endocrinology, 4th Edition. by Dr. Goodman Copyright © 2009 by Academic Press. All rights reserved. 15 Copyright © 2009 by Academic Press. All rights reserved. 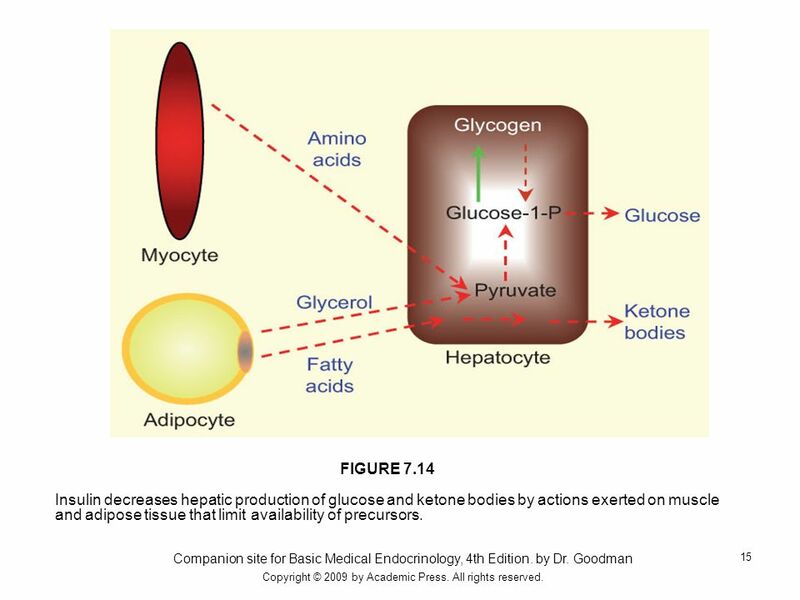 FIGURE 7.14 Insulin decreases hepatic production of glucose and ketone bodies by actions exerted on muscle and adipose tissue that limit availability of precursors. Companion site for Basic Medical Endocrinology, 4th Edition. by Dr. Goodman Copyright © 2009 by Academic Press. All rights reserved. 16 Copyright © 2009 by Academic Press. All rights reserved. 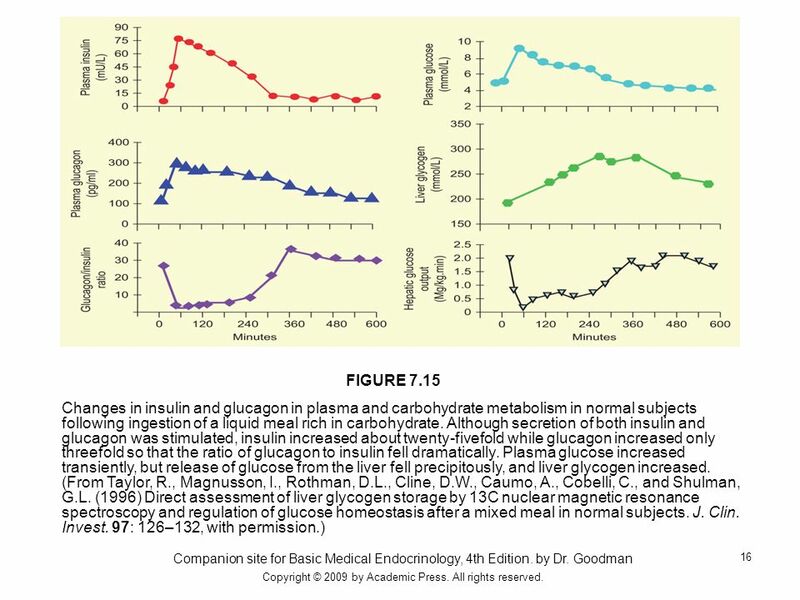 FIGURE 7.15 Changes in insulin and glucagon in plasma and carbohydrate metabolism in normal subjects following ingestion of a liquid meal rich in carbohydrate. Although secretion of both insulin and glucagon was stimulated, insulin increased about twenty-fivefold while glucagon increased only threefold so that the ratio of glucagon to insulin fell dramatically. Plasma glucose increased transiently, but release of glucose from the liver fell precipitously, and liver glycogen increased. (From Taylor, R., Magnusson, I., Rothman, D.L., Cline, D.W., Caumo, A., Cobelli, C., and Shulman, G.L. (1996) Direct assessment of liver glycogen storage by 13C nuclear magnetic resonance spectroscopy and regulation of glucose homeostasis after a mixed meal in normal subjects. J. Clin. Invest. 97: 126–132, with permission.) Companion site for Basic Medical Endocrinology, 4th Edition. by Dr. Goodman Copyright © 2009 by Academic Press. All rights reserved. 17 Copyright © 2009 by Academic Press. All rights reserved. FIGURE 7.16 Effects of insulin on glucose metabolism in hepatocytes. Green arrows indicate reactions that are increased, and dashed red arrows indicate reactions that are decreased. Companion site for Basic Medical Endocrinology, 4th Edition. by Dr. Goodman Copyright © 2009 by Academic Press. All rights reserved. 18 Copyright © 2009 by Academic Press. All rights reserved. FIGURE 7.17 Effects of insulin on lipogenesis in hepatocytes. Green arrows indicate reactions that are increased, and the dashed red arrow indicates a reaction that is decreased. 1. Pyruvate kinase. 2. Pyruvate dehydrogenase. 3. Acetyl CoA carboxylase. 4. Fatty acid synthase. Companion site for Basic Medical Endocrinology, 4th Edition. by Dr. Goodman Copyright © 2009 by Academic Press. All rights reserved. 19 Copyright © 2009 by Academic Press. All rights reserved. 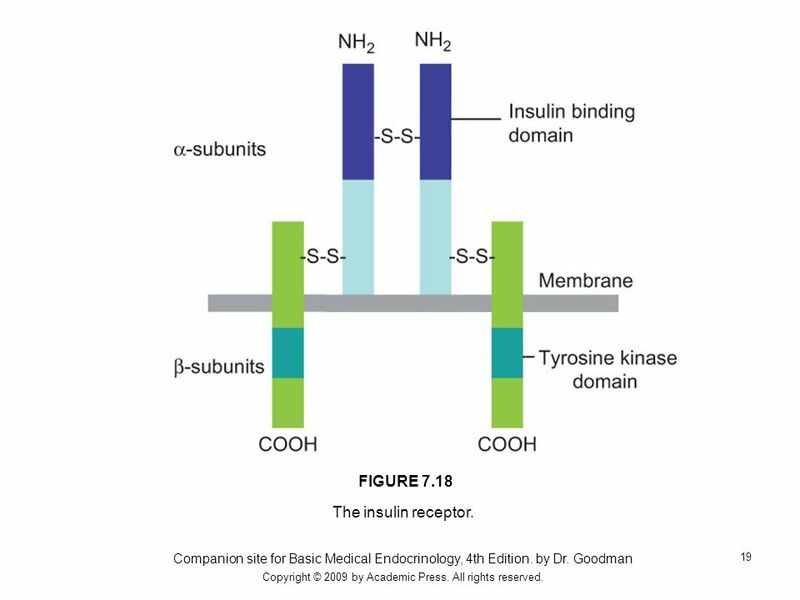 FIGURE 7.18 The insulin receptor. Companion site for Basic Medical Endocrinology, 4th Edition. by Dr. Goodman Copyright © 2009 by Academic Press. All rights reserved. 20 Copyright © 2009 by Academic Press. All rights reserved. FIGURE 7.19 Simplified model of insulin signaling pathways. The insulin receptor proteins (IRS 1,2,3,4), Cbl, Shc, and the  subunits of the insulin receptor are phosphorylated on tyrosine residues by the insulin receptor kinase and serve as anchoring sites for cytosolic proteins that form signaling cascades. Proteins shown in blue boxes are serine/threonine kinases. Specific isoforms and/or subunits are not shown nor are the relevant phosphatases. Shc = Src homology containing protein; Cbl = Cacitas B lineage lymphoma protein; PI3K = phosphoinositol-3-kinase; PDK = phosphoinositide dependent kinase; PKC =  isoform of protein kinase C; PKB = protein kinase B; PDE = phosphodiesterase; RAS = Ras oncogene, a small G-protein; mTOR = mammalian target of rapamycin; GSK = glycogen synthase kinase; ERK = extracellular receptor kinase. Companion site for Basic Medical Endocrinology, 4th Edition. by Dr. Goodman Copyright © 2009 by Academic Press. All rights reserved. 21 Copyright © 2009 by Academic Press. All rights reserved. 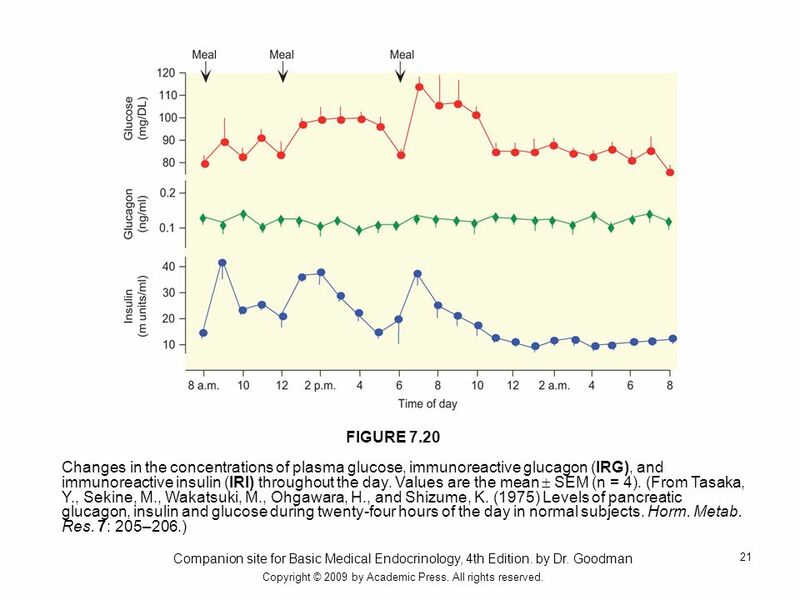 FIGURE 7.20 Changes in the concentrations of plasma glucose, immunoreactive glucagon (IRG), and immunoreactive insulin (IRI) throughout the day. Values are the mean  SEM (n = 4). (From Tasaka, Y., Sekine, M., Wakatsuki, M., Ohgawara, H., and Shizume, K. (1975) Levels of pancreatic glucagon, insulin and glucose during twenty-four hours of the day in normal subjects. Horm. Metab. Res. 7: 205–206.) Companion site for Basic Medical Endocrinology, 4th Edition. by Dr. Goodman Copyright © 2009 by Academic Press. All rights reserved. 22 Copyright © 2009 by Academic Press. All rights reserved. FIGURE 7.21 Insulin secretion by isolated human pancreatic islets in response to increasing concentrations of glucose. A. Stimulus:response curve. The threshold for increased secretion in vivo may be somewhat higher than between 1 and 3 mM/L shown here. 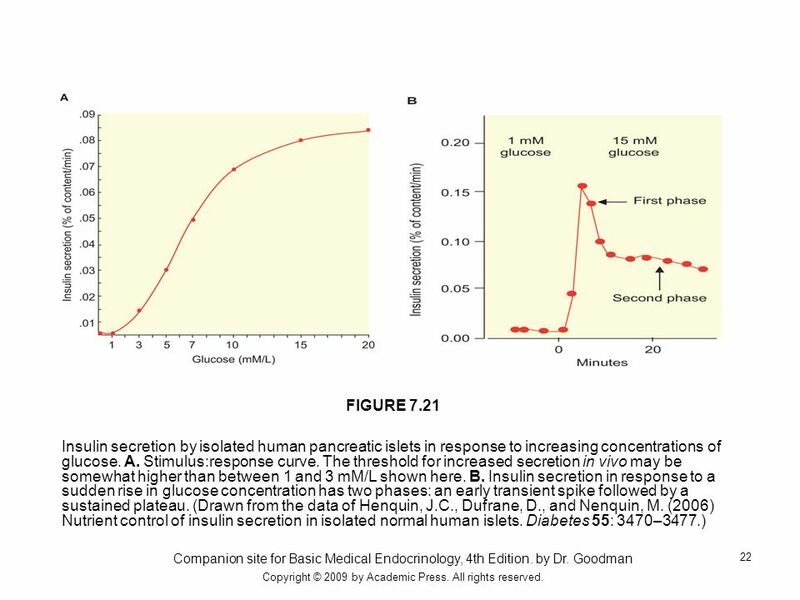 B. Insulin secretion in response to a sudden rise in glucose concentration has two phases: an early transient spike followed by a sustained plateau. (Drawn from the data of Henquin, J.C., Dufrane, D., and Nenquin, M. (2006) Nutrient control of insulin secretion in isolated normal human islets. Diabetes 55: 3470–3477.) Companion site for Basic Medical Endocrinology, 4th Edition. by Dr. Goodman Copyright © 2009 by Academic Press. All rights reserved. 23 Metabolic, hormonal, and neural influences on insulin secretion. 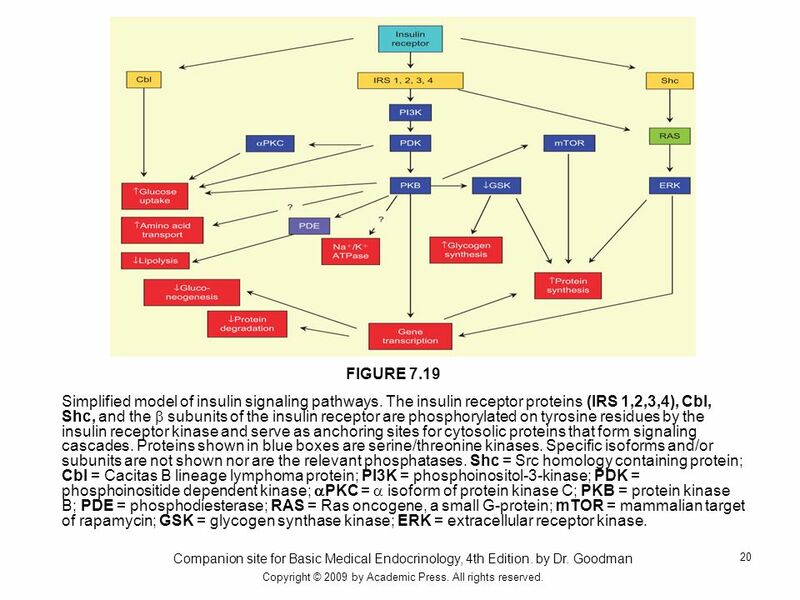 FIGURE 7.22 Metabolic, hormonal, and neural influences on insulin secretion. Companion site for Basic Medical Endocrinology, 4th Edition. by Dr. Goodman Copyright © 2009 by Academic Press. All rights reserved. 24 Copyright © 2009 by Academic Press. All rights reserved. 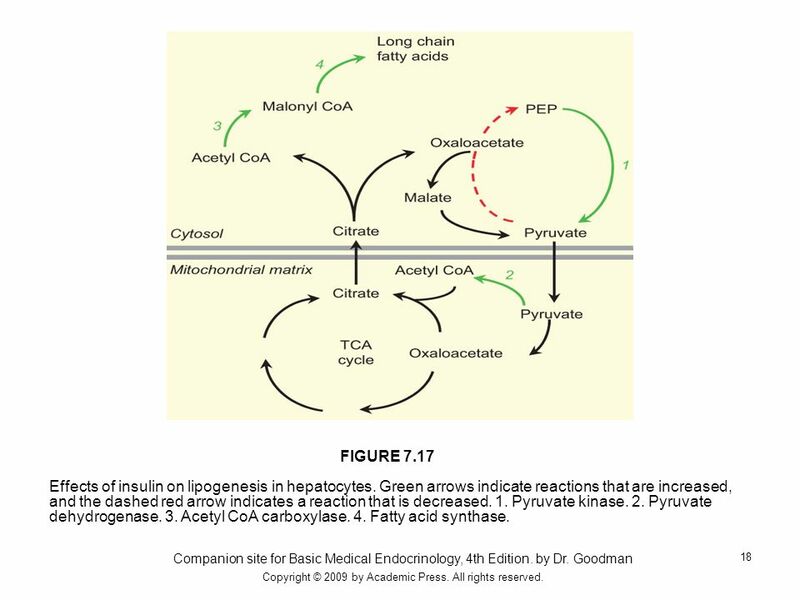 FIGURE 7.23 Triggering of insulin secretion by glucose. A. “Resting” beta cell (blood glucose  100 mg/dl). ADP/ATP ratio is high enough so that ATP-sensitive potassium channels (KATP) are open, and the membrane potential is about 70 mv. Voltage-sensitive calcium channels (VSCC) and calcium-sensitive potassium channels (CSKC) are closed. B. Beta cell response to increased blood glucose. Increased entry and metabolism of glucose decreases the ratio of ADP/ATP, and KATP channels close. 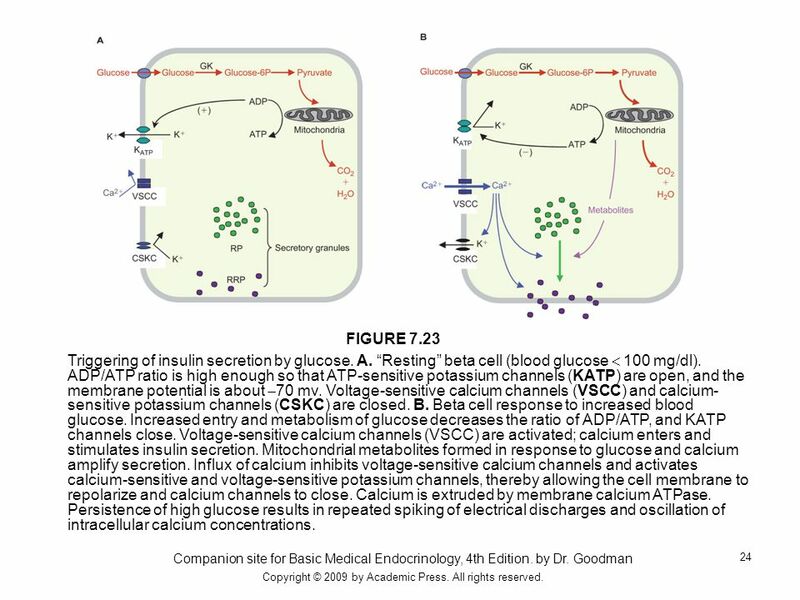 Voltage-sensitive calcium channels (VSCC) are activated; calcium enters and stimulates insulin secretion. Mitochondrial metabolites formed in response to glucose and calcium amplify secretion. Influx of calcium inhibits voltage-sensitive calcium channels and activates calcium-sensitive and voltage-sensitive potassium channels, thereby allowing the cell membrane to repolarize and calcium channels to close. Calcium is extruded by membrane calcium ATPase. Persistence of high glucose results in repeated spiking of electrical discharges and oscillation of intracellular calcium concentrations. Companion site for Basic Medical Endocrinology, 4th Edition. by Dr. Goodman Copyright © 2009 by Academic Press. All rights reserved. 25 Copyright © 2009 by Academic Press. All rights reserved. FIGURE 7.24 Major acute cellular actions of incretins. 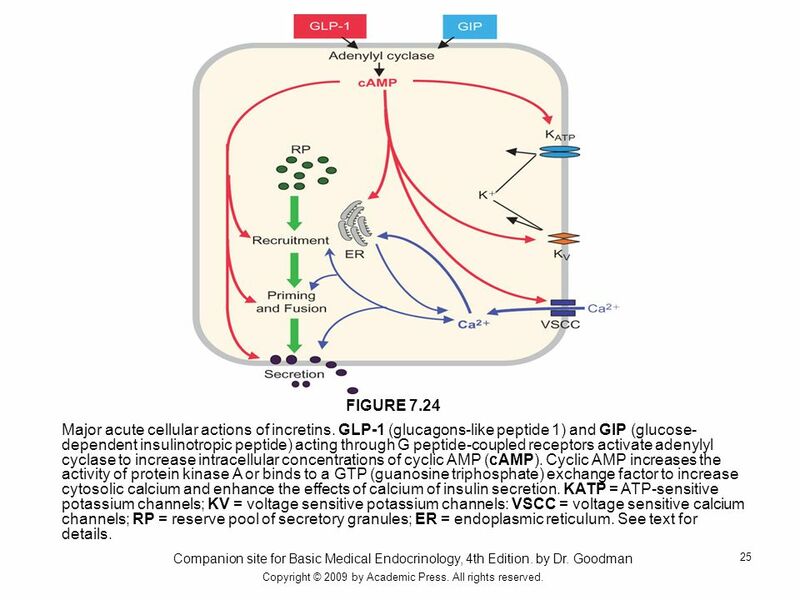 GLP-1 (glucagons-like peptide 1) and GIP (glucose-dependent insulinotropic peptide) acting through G peptide-coupled receptors activate adenylyl cyclase to increase intracellular concentrations of cyclic AMP (cAMP). Cyclic AMP increases the activity of protein kinase A or binds to a GTP (guanosine triphosphate) exchange factor to increase cytosolic calcium and enhance the effects of calcium of insulin secretion. KATP = ATP-sensitive potassium channels; KV = voltage sensitive potassium channels: VSCC = voltage sensitive calcium channels; RP = reserve pool of secretory granules; ER = endoplasmic reticulum. See text for details. Companion site for Basic Medical Endocrinology, 4th Edition. by Dr. Goodman Copyright © 2009 by Academic Press. All rights reserved. Download ppt "Chapter 7 Companion site for Basic Medical Endocrinology, 4th Edition Author: Dr. Goodman." Chapter 5 Companion site for Basic Medical Endocrinology, 4th Edition Author: Dr. Goodman. 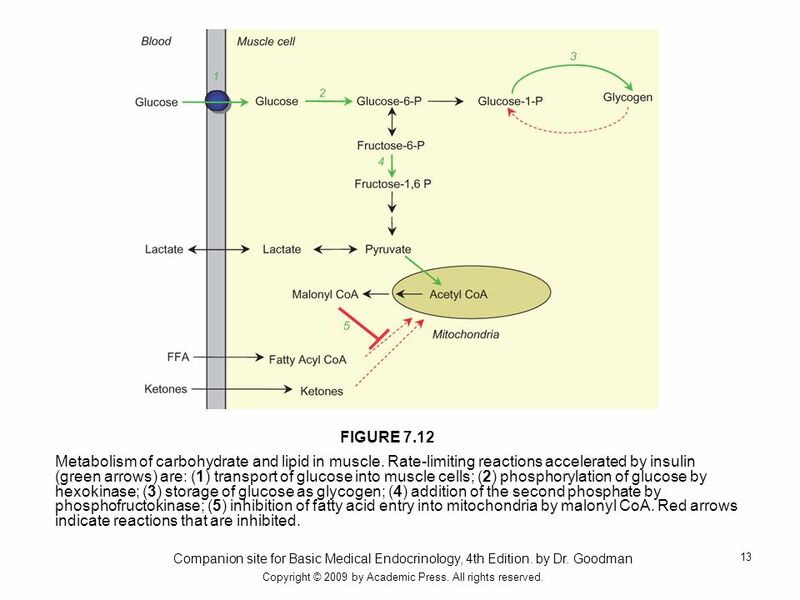 Copyright © 2007 Lippincott Williams & Wilkins.McArdle, Katch, and Katch: Exercise Physiology: Energy, Nutrition, and Human Performance, Sixth Edition. Chapter 7— The Pancreatic Islets focusing on insulin 7-1. 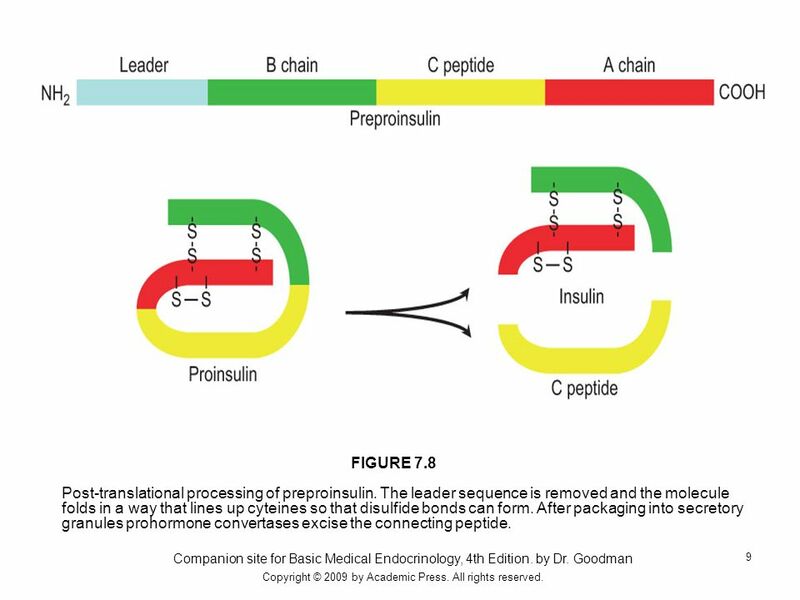 Prentice Hall c2002Chapter 131 Chapter 13 Additional Pathways in Carbohydrate Metabolism Insulin, a 51 amino acid polypeptide that regulates carbohydrate. SEMINARS!!!! Newborn Screening for Enzyme Deficiency Diseases: From Bench to Practice Michael Gelb, UW F 3:15 pm. SL 140. BE THERE! BCHM2072/ THEORY PAPER MCQs Graph The graph below does NOT represent: A. The rate of glucose output from the liver B. The liver. 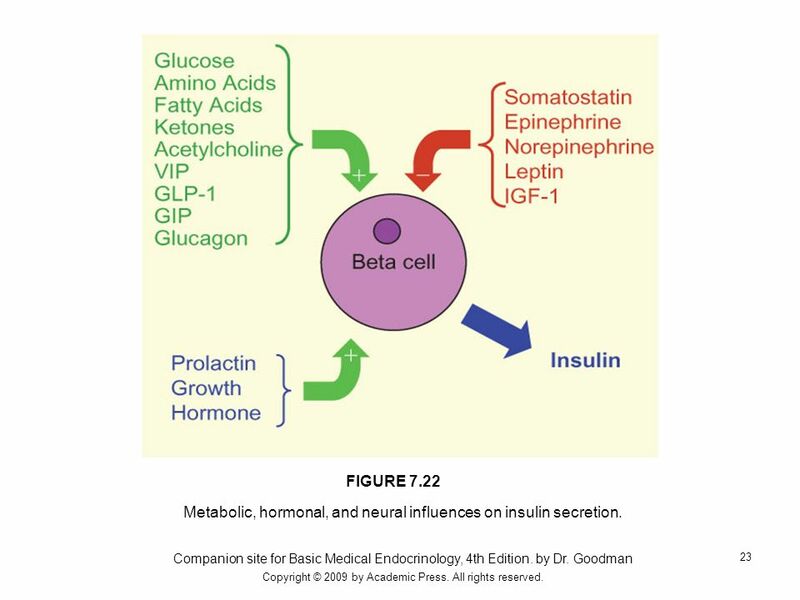 Physiological role of insulin Release of insulin by beta cells –Response to elevated blood glucose level –Effects of insulin Somewhat global Major effects. PANCREATIC HORMONES Dr. Amel Eassawi 1. OBJECTIVES The student should be able to:  Know the cell types associated with the endocrine pancreas.  Discuss. Biological effects of GH Somatotropic –Growth and cell proliferation IGF-I mediated Metabolic –Direct action of GH IGF-I independent Many tissues All nutrients. Endocrine Physiology PANCREAS Dr. Meg-angela Christi M. Amores. Regulation of Metabolic Pathways Systems must respond to conditions Homeostasis is not equilibrium Dynamic Steady State –Flux - Rate of metabolic flow. Gluconeogenesis Dr. Tarek A Salem. Glucose Homeostasis By Dr. Sumbul Fatma.